Danish businessman and LEGO(Tm) creator Ole Kirk Christiansen, Sadly died On 11 March 1958, after suffering a heart attack when he was 66 years old. He was born 7 April 1891 in Filskov, Denmark. He trained as a carpenter and started making wooden toys in 1932 to make a living after having lost his job during the depression. Sadly though, shortly after the depression Christiansen’s wife also died, leaving him to raise his four sons by himself. Christiansen knew the value of hard wearing toys So to make ends meet he decided to construct a small wooden duck toy for his children. When he found that his sons loved the new toy he decided to put the ducks into production using the leftover wood from his old business. He then went on to making miniature versions of the houses and furniture, which also became quite successful. Unfortunately though In 1942 a fire broke out at the factory destroying Ole’s life’s work and forcing them to rebuild from scratch. So in 1947 he invested in a revolutionary injection-moulding machine Imported from Britain in 1947 for 30,000 Danish kroner (£3,200). After Building a new factory, Ole set about re-making his lost designs and moved on to manufacturing plastic items rather than wood, these originally consisted of small plastic bears and rattles. By 1949 he had produced over 200 plastic and wooden toys. Then, two years after buying the injection-moulding machine, he produced the first Lego bricks, called Automatic Binding Bricks, they looked similar to today’s blocks but had a slit in the sides and were completely hollow. Ole Kirk Christiansen came up with the name Lego from the Danish words leg godt, meaning “play well”, and the company grew to become the Lego Group. Then In 1954, Ole’s son Godtfred, the firm’s junior managing director returned from a UK toy fair with the idea of creating a toy system in which every element could connect together to build things, and by 1958 the firm had patented the colourful bricks with hollow tubes on the underside so they could be locked together and the story of the Lego brick began. Following his tragic death his third son Godtfred Kirk Christiansen promptly took over the company and developed his idea of interconnecting bricks culminating in The first Lego set, Town Plan No.1, which had everything a child needed to make their own model town centre, this became a huge success. Since then Lego(tm) has grown to become a household name, annually selling many million sets worldwide. Then In 1968 they opened a theme park at their HQ in Billund, Denmark — the first of six worldwide. A year later came Lego Duplo for under-fives and in 1978 “minifigure” people. Since then, all manner of themed Lego sets have hit shelves, from pirates, Outer Space, Lord of the Rings, Star Wars, Ninjago to Harry Potter and today, eight Lego sets are sold every Second worldwide. The UK even has its own Legoland which opened in Windsor in 1996 and there are now Lego-only stores, Lego computer games including Lego batman. There are two rather entertaining LEGO Movies and even a clothing range. Regarded as one of the most influential German film directors of the silent era, the German film director Friedrich Wilhelm Murnau sadly died March 11, 1931. He was born 28th December in Bielefeld, Province of Westphalia. By the age of seven, he was living in Kassel, northern Hesse. He had two brothers, Bernhard and Robert, and two stepsisters, Ida and Anna. His mother, Otilie Volbracht, was the second wife of his father, Heinrich Plumpe, an owner of a cloth factory in the northwest part of Germany. Their villa was often turned into a stage for little plays, directed by the young Friedrich, who had already read books by Schopenhauer, Nietzsche, Shakespeare and Ibsen plays by the age of 12. He took the pseudonym of “Murnau” from the town of that name near Lake Staffel, south of Munich, where he once lived for a period of time. At 6 ft 11 in (2.11 m) tall, the young Murnau was said to have an icy, imperious disposition and an obsession with film. Murnau studied philology at the University in Berlin and later art history and literature in Heidelberg, where director Max Reinhardt saw him at a students’ performance and decided to invite him to his actor-school. He soon became a friend of Franz Marc (the Blue Rider artist based in Murnau), Else Lasker-Schüler and Hans Ehrenbaum-Degele. During World War I Murnau served as a company commander at the eastern front, where he joined the Imperial German Flying Corps and flew missions in northern France for two years; surviving eight crashes without severe injuries. After landing in Switzerland, he was arrested and interned for the remainder of the war. In his POW camp he was involved with a prisoner theater group and wrote a film script. After the end of World War One Murnau returned to Germany where he soon established his own film studio with actor Conrad Veidt. His first feature-length film, The Boy in Blue, was a drama inspired by the famous Thomas Gainsborough painting, and was released in 1919. He also explored the popular theme of dual personalities, like Robert Louis Stevenson’s Dr. Jekyll and Mr. Hyde, for the 1920 film Der Janus-Kopf which starred Veidt and featured Bela Lugosi. Murnau went on to Become a prominent figure in the expressionist movement in German cinema during the 1920s. Murnau’s best known work was his 1922 film NOSFERATU an adaptation of Bram Stoker’s Dracula. 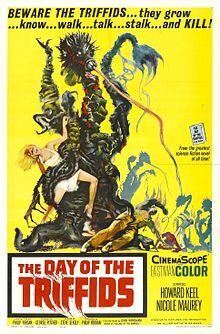 Although not a commercial success due to copyright issues with Stoker’s novel, the film was a considered a masterpiece of Expressionist artwork. He was also known for the 1924 film The Last Laugh and his interpretation of Goethe’s Faust (1926). F.W. Murnau later emigrated to Hollywood in 1926, where he joined the Fox Studio and made three films, including Sunrise (1927), Four Devils (1928) and City Girl (1930). In 1931 Murnau travelled to Bora Bora to make the film Tabu with documentary film pioneer Robert Flaherty. However Flaherty left following artistic disputes with Murnau who was left to finish the movie on his own. Unfortunately though A week prior to the opening of the film Tabu, Murnau had an Automobile accident along the Pacific Coast Highway near Rincon Beach, south of Santa Barbara and subsequently died on 11 March 1931 from his injuries in a Santa Barbara hospital, California. However he has left behind an enduring legacy in the form of some fantastic films. English Science Fiction Author John Wyndham sadly died 11 March 1969. He was born 10 July 1903 in the village of Dorridge near Knowle, Warwickshire (now West Midlands), England, the son of George Beynon Harris, a barrister, and Gertrude Parkes, the daughter of a Birmingham ironmaster. His early childhood was spent in Edgbaston in Birmingham, but when he was 8 years old his parents separated and he and his brother, the writer Vivian Beynon Harris, spent the rest of their childhood at a number of English preparatory and public schools, including Blundell’s School in Tiverton, Devon, during World War I. His longest and final stay was at Bedales School near Petersfield in Hampshire (1918–21), which he left at the age of 18, and where he blossomed and was happy. In 1963, he married Grace Isobel Wilson, whom he had known for more than 20 years; the couple remained married until he died. He and Grace lived for several years in separate rooms at the Penn Club, London and later lived near Petersfield, Hampshire, just outside the grounds of Bedales School. He died in 1969, aged 65, at his home in Petersfield, survived by his wife and his brother. Subsequently, some of his unsold work was published; and his earlier work was re-published. His archive was acquired by Liverpool University. On 24 May 2015 an alley in Hampstead that appears in The Day of the Triffids was formally named Triffid Alley as a memorial to him. Famous for being Captain Jack Harkness in the Science fiction television shows Doctor Who and Torchwood, the Scottish-American actor, singer, dancer, presenter and writer John Scot Barrowman, MBE was born 11 March 1967 in Glasgow, Scotland, he moved to the United States with his family in 1975. Encouraged by his high school teachers, Barrowman studied performing arts at the United States International University in San Diego before landing the role of Billy Crocker in Cole Porter’s Anything Goes at London’s West End. Since his debut in professional theatre, Barrowman has played lead roles in various musicals both in the West End and on Broadway, including Miss Saigon, The Phantom of the Opera, Sunset Boulevard and Matador. After appearing in Sam Mendes’ production of The Fix, he was nominated for the 1998 Laurence Olivier Award for Best Actor in a Musical and, in the early 2000s, returned to the role of Billy Crocker in the revival of Anything Goes. His most recent West End credit was in the 2009 production of La Cage aux Folles. Aside his theatrical career, Barrowman has appeared in various films including the musical biopic De-Lovely (2004) and musical comedy The Producers (2005). Before venturing into British television, he featured in the American television dramas Titans and Central Park West but he is better known for his acting and presenting work for the BBC that includes his work for CBBC in its earlier years, his self-produced entertainment programme Tonight’s the Night, and his BAFTA Cymru-nominated role of Captain Jack Harkness in the science fiction series Doctor Who and Torchwood. Barrowman has also had a number of guest roles in television programmes both in the US and the UK. He appeared as a contestant on the first series of celebrity ice skating show Dancing on Ice while his theatrical background allowed him to become a judge on Andrew Lloyd Webber’s musical talent shows How Do You Solve a Problem like Maria?, Any Dream Will Do and I’d Do Anything. In 2006, he was voted Stonewall’s Entertainer of the Year. Starting in 2013, he hosts the BBC One quiz show Pressure Pad. Barrowman now stars in the CW’s Arrow as Malcolm Merlyn, the show’s version of the DC villain Merlyn and one of the series’ main antagonists. Barrowman is also featured on more than a dozen musical theatre recordings including cover tunes found on his 2007 album, Another Side, and 2008’s Music Music Music. Both albums accrued places on the UK Albums Chart, as did his self-titled John Barrowman (2010), which reached number 11, his highest chart placing to date. Barrowman has also published two memoirs and autobiographies, Anything Goes (2008) and I Am What I Am (2009), with his sister Carole as co-author. The siblings also teamed up to write a novel, Hollow Earth (2012). The second book in the series, Bone Quill, has been released in the UK and was released in the US in July 2013. English actress Alex Kingston was born 11 March 1963. She was brought up in Epsom, Surrey and was inspired to pursue acting by one of her teachers at Rosebery School for Girls. Kingston auditioned and performed in the Surrey County Youth Theatre production of Tom Jones as Mrs Fitzpatrick, alongside Sean Pertwee as Captain Fitzpatrick and Thwackum played by Tom Davison. She later completed a three-year programme at the Royal Academy of Dramatic Art and went on to join the Royal Shakespeare Company. Since then Kingston has appeared in a number of British-produced television dramas, including Grange Hill, Crocodile Shoes, The Fortunes and Misfortunes of Moll Flanders, The Knock and various guest roles on The Bill. Kingston’s film credits include The Cook, the Thief, His Wife & Her Lover (1989), A Pin for the Butterfly (1994), The Infiltrator (1995), Croupier (1998), Essex Boys (2000), Boudica (Warrior Queen in the USA) (2003) in which she played the eponymous Boudica, Sweet Land (2005) and Crashing (2007). In September 1997, Kingston gained North American television fame after being cast on the long-running medical drama ER as British surgeon Elizabeth Corday. Kingston played this role for just over seven seasons, leaving in October 2004 with the season 11 episode, “Fear”. In spring 2009, Kingston returned to ER during its 15th and final season for two episodes, “Dream Runner” and the two-hour series finale, “And in the End…”.In November 2005, Kingston guest-starred in the long-running mystery drama Without a Trace in the season 4 episode, “Viuda Negra”. She also portrayed Lucy Costin, a wealthy vacationer from the U.S. whose husband is kidnapped by a Mexican street gang during their honeymoon. In 2006, Kingston starred as Nurse Ratched, opposite Christian Slater as Randle Patrick McMurphy, in the Garrick Theatre’s West End production of One Flew Over the Cuckoo’s Nest. In 2008, Kingston guest-starred in the fourth series of the science fiction television programme Doctor Who in the two-part story “Silence in the Library”/”Forest of the Dead” as River Song. She reprised the role in fifteen episodes in 2010, 2011, 2012, 2013 and 2015. Kingston says she thought her role was simply a one-off, but was delighted that she would be a returning character. Kingston returned as the character in the 2015 Christmas special, “The Husbands of River Song” alongside Peter Capaldi’s Twelfth Doctor. In September 2008, Kingston took the part of Mrs. Bennet in ITV’s acclaimed four-part production Lost in Austen which is based on Jane Austen’s Pride and Prejudice and also appeared in the police procedural drama CSI: Crime Scene Investigation in the season 9 episode, “Art Imitates Life” as Patricia Alwick, a psychiatrist and grief counsellor. During 2009, Kingston portrayed Miranda Pond, a defence attorney in two episodes of the legal drama Law & Order: Special Victims Unit. Kingston also starred as the lead character Ellie Lagden, one of four former convicts in the BBC One drama series Hope Springs And Had a recurring role in FlashForward, playing Inspector Fiona Banks. In 2010, Kingston returned to Law & Order: Special Victims Unit in the season 12 episode, “Trophy”. In 2011, Kingston appeared in the British supernatural series Marchlands, portraying Helen Maynard and also guest-starred in the Grey’s Anatomy spin-off Private Practice as Marla Tompkins, a psychiatrist who writes book reviews for newspapers. Kingston appeared in Friedrich Schiller’s Luise Miller at the Donmar Warehouse in London. In 2013, Kingston appeared in Arrow, playing Professor Dinah Lance, the mother of Laurel and Sara Lance and also played Lady Macbeth opposite Kenneth Branagh in Macbeth at Manchester International Festival. Her performance was broadcast to cinemas on 20 July as part of National Theatre Live.She reprised the performance with Branagh at the Park Avenue Armory in New York in 2014. She also starred as Ruth Hattersley, an analyst working for the Missing Persons Bureau on the ITV mini-series drama Chasing Shadows. Best known as the author of The Hitch Hiker’s Guide to the Galaxy, English author Douglas Adams, was Born 11th March 1952 in Cambridge, England, he attended Primrose Hill Primary School in Brentwood. At nine, he passed the entrance exam for Brentwood School, an independent school whose alumni include Robin Day, Jack Straw, Noel Edmonds, and David Irving. Griff Rhys Jones was also a year below him. He attended the prep school from 1959 to 1964, then the main school until December 1970. He became the only student ever to be awarded a ten out of ten by Halford for creative writing, some of his earliest writing was published at the school, such as reports or spoof reviews in the school magazine Broadsheet He also designed the cover of one issue of the Broadsheet, and had a letter and short story published nationally in The Eagle, in 1965, he was awarded a place at St John’s College, Cambridge to read English, Which he attended from 1971, though the main reason he applied to Cambridge was to join the Footlights, an invitation-only student comedy club that has acted as a hothouse for some of the most notable comic talent in England. he graduated from St. John’s in 1974 with a B.A. in English literature. After leaving university Adams moved back to London, determined to break into TV and radio as a writer. The Footlights Revue appeared on BBC2 television in 1974 and also performed live in London’s West End which led to Adams being discovered by Monty Python’s Graham Chapman. The two formed a brief writing partnership, earning Adams a writing credit in episode 45 of Monty Python for a sketch called “Patient Abuse”, which plays on the idea of mind-boggling paper work in an emergency, a joke later incorporated into the Vogons’ obsession with paperwork. Adams also contributed to a sketch on the album for Monty Python and the Holy Grail. Adams also continued to write and submit other sketches, though few were accepted. In 1976 he wrote and performed, Unpleasantness at Brodie’s Close at the Edinburgh Fringe festival. Some of Adams’s early radio work included sketches for The Burkiss Way in 1977 and The News Huddlines. He also wrote the 20 February 1977 episode of the “Doctor on the Go” television comedy series, with Graham Chapman. After writing the Doctor Who episode “The Pirate planet” Adams became the script editor for Doctor Who’s seventeenth season in 1979 and wrote three Doctor Who serials starring Tom Baker as the Doctor: The Pirate Planet, City of Death and Shada. Adams also allowed in-jokes from The Hitchhiker’s Guide to appear in the Doctor Who stories he wrote and other stories on which he served as Script Editor. Elements of Shada and City of Death were also reused in Adams’s later novel Dirk Gently’s Holistic Detective Agency, Adams is also credited with introducing a fan and later friend of his, the evolutionaruy biologist Richard Dawkins, to Dawkins’s future wife, Lalla Ward, who had played the part of Romana in Doctor Who. Adams also sent the script for the HHGG pilot radio programme to the Doctor Who production office in 1978. The Hitchhiker’s Guide to the Galaxy started As a concept for a science-fiction comedy radio series pitched by Adams and radio producer Simon Brett to BBC Radio 4 in 1977. Adams came up with an outline for a pilot episode, as well as a few other stories (reprinted in Neil Gaiman’s book Don’t Panic: The Official Hitchhiker’s Guide to the Galaxy Companion) that could potentially be used in the series. It started life in 1978 as a BBC radio comedy and a after the first radio series became successful, Adams was made a BBC radio producer, working on Week Ending and a pantomime called Black Cinderella Two Goes East. 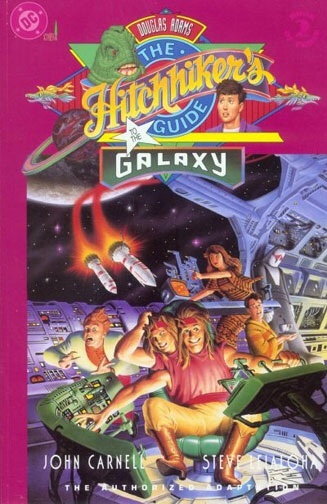 The Hitchhiker’s Guide to the Galaxy was also developed into a series of five books that sold over 15 million copies in his lifetime, a television series, several stage plays, comics, a computer game, and in 2005 a feature film. Adams’s contribution to UK radio is commemorated in The Radio Academy’s Hall of Fame. Adams also wrote Dirk Gently’s Holistic Detective Agency (1987) and The Long Dark Tea-Time of the Soul (1988), and co-wrote The Meaning of Liff (1983), Last Chance to See (1990), and three stories for the television series Doctor Who. A posthumous collection of his work, including an unfinished novel, was published as The Salmon of Doubt in 2002. He submit a potential movie script, which later became his novel Life, the Universe and Everything (which in turn became the third Hitchhiker’s Guide radio series). As of March 2018 a New series of Hitch hikers guide to the Galaxy has also recently been broadcasting Thursdays on BBC Radio 4. Adams’s official biography shares its name with the song “Wish You Were Here” by Pink Floyd. Adams was friends with Pink Floyd guitarist David Gilmour and, on the occasion of Adams’s 42nd birthday (the number 42 having special significance, being the Answer to the Ultimate Question of Life, the Universe and Everything and also Adams’s age when his daughter Polly was born), he was invited to make a guest appearance at Pink Floyd’s 28 October 1994 concert at Earls Court in London, playing guitar on the songs “Brain Damage” and “Eclipse”. Adams chose the name for Pink Floyd’s 1994 album, The Division Bell, by picking the words from the lyrics to one of its tracks, namely “High Hopes”. Gilmour also performed at Adams’s memorial service following his death on 11th May 2001 and what would have been Adams’ 60th birthday party in 2012. Douglas Adams was also a friend of Gary Brooker, the lead singer, pianist and songwriter of the progressive rock band Procol Harum. Adams is known to have invited Brooker to one of the many parties that Adams held at his house. On one such occasion Gary Brooker performed the full version of his hit song “A Whiter Shade of Pale”. Brooker also performed at Adams’s memorial service. Adams also appeared on stage with Brooker to perform “In Held Twas in I” at Redhill when the band’s lyricist Keith Reid was not available.